Apple’s iOS (s aapl) home screen may be simple and effective, but it doesn’t offer much in the way of dynamically updating content. 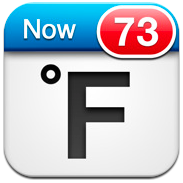 Two new apps, Fahrenheit and Celsius (there’s a separate app for both temperature scales), do the best with what Apple provides to offer dynamically updating local temperature you can check without ever opening an app. I’d love some dynamically updating weather conditions in addition to the temperature, but until Apple makes some major changes to iOS, that’s not going to happen. For now, Fahrenheit and Celsius more than fit the bill, thanks in no small part to smart app icon design that makes it instantly apparent that the badge is telling you the current temperature. It may not be as fancy as an Android (s goog) widget, but it’s simple, smart and it gets the job done. I read the review and bought the app. The rub is that the temperature only updates when you launch the app. The review did not go into the depth I expect of this web page. Pocket Weather has been doing this for years on iOS. How is this news on about 3 or 4 sites at the moment?? The week I bought my 3GS I got Pocket Weather AU. Does the same thing and has done for years. Not that amazing. Another way to drain the battery unnecessarily. Still not getting widgets, unfortunately. Pocket Weather has done this for years. Great little app. Can you upload the wallpaper you’re using? Why would they even bother making a separate iphone app for Celsius. Seems like a waste of time unless they were combined. I mean who checks Celsius, seriously… lol! Countries that don’t use the metric system. Apple only allows icons to be displayed on the home screen, and the only dynamic one of those is its own Calendar app. That doesn’t seem right … I have a 3rd party app (Things) that has a dynamic icon (shows numbers of to-do items). Unless you mean something else entirely.